A fluidized-bed combustor is a furnace chamber whose floor is slotted, perforated, or fitted with nozzles. Air is forced through the floor and upward through the chamber. Although there are other types of combustors fluidized-bed combustors are more commonly used in char combustion. The chambers are partially filled with char particles, which will fluidize at an air flow rate. When fluidization takes place, the bed of char expands and exhibits the properties of a liquid. As air velocity increases, the particles mix more violently, and the surface of the bed increases in temperature to combustion. 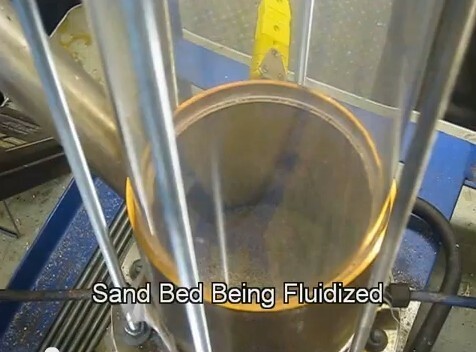 "Fluidized Bed Combustion." Mother Earth News. N.p., n.d. Web. 16 Jan. 2013. .
Answers.com. Answers, n.d. Web. 15 Jan. 2013. <http://www.answers.com/topic/fluidized-.bed-combustion>. 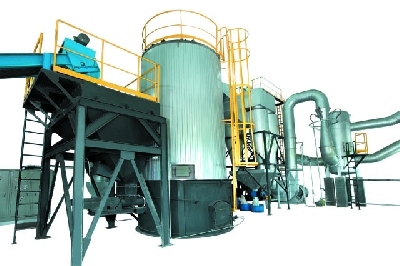 Fluidized Bed Combustor. N.p., n.d. Web. 16 Jan. 2013. <1. http://www.fossil.energy.gov/education/energylessons/coal/coal_cct4.html>. "BASUKI | Product Â» THERMAL OIL HEATERS Â» FLUIDIZED BED OIL HEATERS." BASUKI. N.p., n.d. Web. 16 Jan. 2013. .